So far, we just have heard about Quantum computing that could make even complex calculations trivial, but there are no practical Quantum computers exist. However, the dream of Quantum computers could become a reality in coming future. Cambridge Quantum Computing Limited (CQCL) has build a new Fastest Operating System aimed at running the futuristic superfast quantum computers. 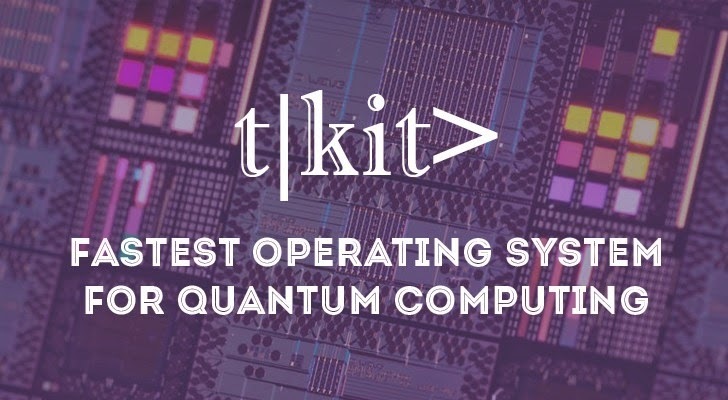 The new operating system, dubbed t|kit>, has been featured by CQCL's very own proprietary custom designed high-speed super mechanism, allowing the company to accurately impersonate the working of a quantum processor. "CQCL is at the forefront of developing an operating system that will allow users to harness the joint power of classical super computers alongside quantum computers," the company said in a press release. "The development of t|ket> is a major milestone." Researchers have been working on significant activities to develop quantum computing technology that might enable the development of a Superfast quantum computer, though there has been less work done in the development of an Operating System that might control the quantum computers. However, CQCL researchers have done just that and also believe that "Quantum computing will be a reality much earlier than originally anticipated. It will have profound and far-reaching effects on a vast number of aspects of our daily lives." CQCL's new operating system for the quantum computer comes just days after IBM researchers brought us even closer to a working Superfast quantum computer by discovering a new method for correcting two errors that a quantum computer can make. One of the biggest issues that prevent us from developing Superfast Quantum Computers is — Quantum computing is incredibly fragile, and even the slightest fault can cause a major error to the computer. However, IBM researchers have discovered a new way to detect both types of quantum computer errors, and revealed a new, square quantum bit circuit design that, according to them, can be easily scaled up to make high-performance computers, according to the details published in Nature Communications. What’s the difference between a Regular computer and a Quantum computer? Traditional computers use the "bits" to represent information as a 0 or a 1; therefore they are so much slower. On the other hand, Quantum computers use "qubits" (quantum bits) to represent information as a 0, 1, or both at the same time. But, the major problem with qubits is that they sometimes flip without warning. Qubits can suddenly flip from 0 to 1, which is called a bit flip, or from 0+1 to 0-1, which is called a phase flip. And these flipping are the actual culprits that creates all kinds of errors in a quantum computer. Until now, scientists could only detect one error at a time. However, IBM's quantum circuit, consisting of four superconducting qubits on a one-quarter inch square chip, allowed researchers to detect bit-flip as well as phase-flip quantum errors simultaneously.